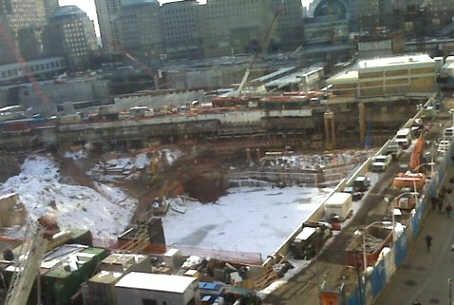 The Ground Zero mosque developer is being sued by a bank for defaulting on a $100,000 credit line. His firm was forced to move from its office. New York's Ground Zero mosque developer is being sued by a bank for defaulting on a credit line, and his firm has been forced to move from its office. Sharif El-Gamal's real estate firm, Soho Properties, held a $100,000 line of credit from the Valley National Bank, which it secured in 2008. El-Gamal personally guaranteed the credit line, according to a report published October 17 in the New York Post. However, the firm defaulted on the loan in early 2009, possibly due to the global economic crash, plus skyrocketing costs due to the need to fend off numerous challenges to the project on Park Place. Last month, with Soho Properties in arrears on its rent to the tune of some $39,000, the landlord initiated eviction proceedings. El-Gamal moved the firm out of the office – but is now facing a lawsuit from the bank, which seeks $95,778 plus interest on the unpaid loan. The developer also owes money on city taxes, which were due in January and July, but last month settled with the city on a payment plan for $270,000, including the interest. The project, which involves the former Burlington Coat Factory building, to be renamed Cordoba House, includes plans for a 13-story mosque, health club and Islamic community center. Grassroots groups across the country oppose the project because it is located just two blocks from the spot where Al-Qaeda hijackers rammed two airliners into the Twin Towers of the World Trade Center on “9/11” -- September 11, 2001 -- bringing down both buildings. Nearly 3,000 people were murdered in that conflagration and the simultaneous attack on the Pentagon in Washington, as well as the downing of an airliner in an open field in Pennsylvania, allegedly headed for the White House.